Coast Hotel Workers Ratify New Agreement! UNITE HERE Local 40 members at the Coast Hotels in Victoria, Nanaimo, Kelowna and Prince George have voted 92% to ratify a new 3-year contract that will dramatically improve access to health care benefits for workers and their families. The settlement was reached on the verge of potential strikes in the Nanaimo and Victoria hotels. Local 40’s bargaining committee and Coast management reached agreement that effective January 1, 2013, the hours needed for health care eligibility will be lowered from 30 hours/week to an average of 20 hours/week. With this victory, Coast workers now have the best eligibility system in any of Local 40’s contracts. Other worker goals that were met in this settlement include additional reductions to room attendant workload, improved banquet workers’ rights, establishment of paid sick time, improved pension contributions to include paid time off, a 5% wage increase and improved extended health care benefits so that room attendants can receive much needed physiotherapy. “These were challenging negotiations but we’re very pleased Coast management has chosen to take the lead in addressing health care eligibility and improving key benefits for their employees. 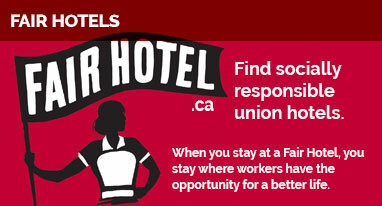 We’re hoping this will set the pattern for hotels around the province,” said Robert Demand, Chief Negotiator for Local 40. Coast Discovery Inn workers in Campbell River will be voting soon on their own contract settlement which provides for the same improvements in health care eligibility and benefits, improved pension contributions and room attendant workload reductions. Local 40 is continuing discussions with Coast management about the Coast Coal Harbour Hotel in Vancouver. http://www.uniteherelocal40.org/wp-content/uploads/local40logo-300x155.png 0 0 admin http://www.uniteherelocal40.org/wp-content/uploads/local40logo-300x155.png admin2012-11-04 10:50:232012-11-04 10:50:23Coast Hotel Workers Ratify New Agreement! HIR Rally at the Blue Horizon Rally Tuesday to save the Waldorf Hotel!